On this last day of July, I am filled with thanksgiving, as we are so happy to be hosting several visitors. It is such a gift to have friends who have come to Tenwek to help with various projects. The Knox Girls are truly wonderful servants, helping with whatever needs to be done… which often involves helping with the McCropder Small Children. 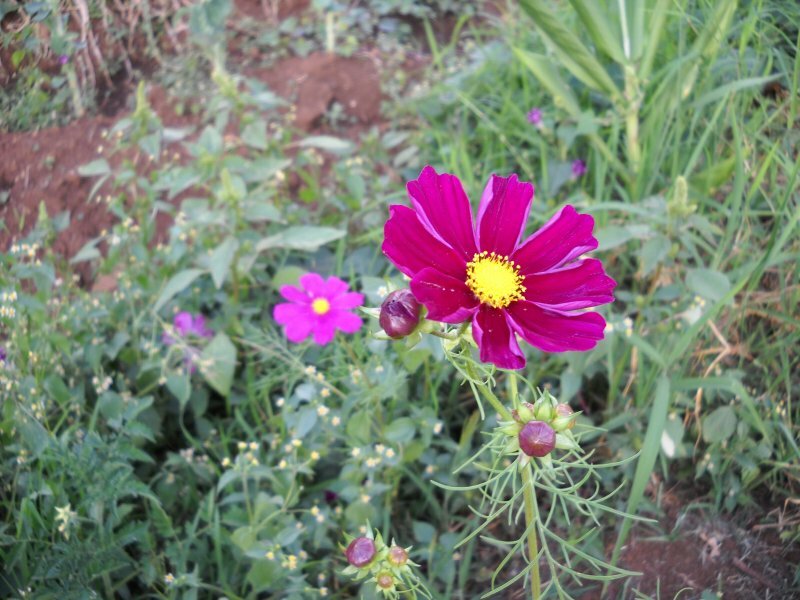 You can read their thoughtful reflections on their Kenyan experiences here. We are also thrilled to be spending two fun weeks with some friends of the Faders' from Wisconsin, and tomorrow we happily welcome Jason’s cousin from New Hampshire. and helping at orphanages and at the hospital. Here are Kim and Abby feeding newborn triplets in the Tenwek nursery. We love to process their observations with our guests as they take in both beauty and sorrow (often mixed together) in many of their experiences here. They observe that the hospital can seem filled with healing and hope, even in the midst of disease and grief. 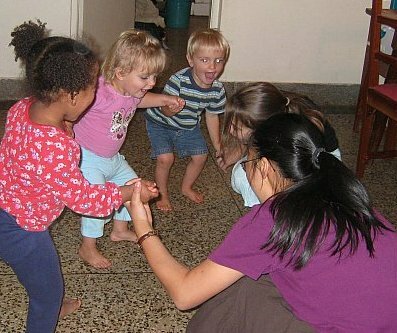 The orphanages are heart-breaking, while at the same time the orphaned children themselves are inexpressibly precious. You could pray for our visitors (and for us) as we see and touch many manifestations of poverty, hope, health care, brokenness, suffering, and joy. It is truly a joy for us to share our lives here in Kenya with our visitors from home! 1. "Will you take tea?" The word "take" used for food or drink I think has some British roots. This is asked pretty much daily in the hospital. I think if we HAD chai time in America, which we don't but could be a nice thing to adapt, someone would ask, "Will you be having tea?" But I'm not sure. 2. "Somehow." As in, was your night busy last night on call? The reply, It was somehow busy....kidogo (a little). What's that? Somehow? Does the patient look well enough to go home? No, she is somehow sick. I think it is closest to the American phrase, "sort of," but somehow just gives it as mystic, who knows kind of quality. Endearing. 3. "Even me" I first heard this out of the mouth of a Kenyan kid asking for a bottle of Coke. There were some sodas on the table and he turned to me and said, "Even me, I want." I thought this was just a cute kid at the very beginning of his English grammar lessons, but since then I have heard it a lot. I think it's like, me too. Should we all go for lunch now? Even me, I would like lunch. 4. Leaving out objects. Eric and I went to go buy some sodas at a shop near the hospital. We asked if they had Bitter Lemon and the shop owner shook his head slightly. To confirm, I asked in true Kenyan fashion, "You do not have?" This was the hardest to remember what we would have said in American, namely, "You don't have any?" 5. The eyebrow raise. This is non-verbal but my very favorite of all the "phrases." Instead of saying yes to a question someone asks you, you can just make a non-committal grunting noise in the back of your throat and raise your eyebrows slightly. I like to use this one when Eric asks me a question for which I feel there is an obvious answer (and thus, the question did not need to be asked). Perhaps we will come back and all will be well with our speech. Or perhaps we'll slip in some -isms. Or perhaps, even, we will have accents. Anna Fader does (if you've forgotten, click here for some hilarity). 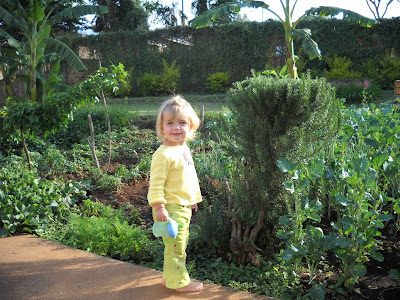 Shortly after our arrival here, we commandeered some of the empty garden (or "shamba" in Kiswahili) plots behind McCropder-plex. 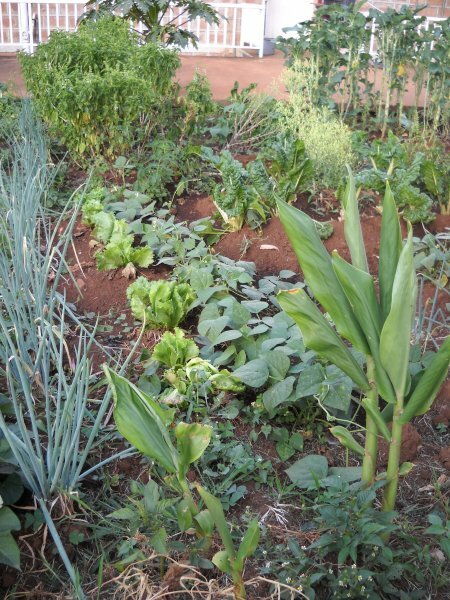 In addition to a nice plot to grow some of the more typical American foods, which we can't find around here (broccoli, spinach, basil) as well as some of the local foods that we enjoy (sweet potatoes, carrots, cilantro), we have a number of crops you don't often find stateside. Maggie is standing here next to our rosemary tree, which was featured before, now a shadow of it's former glory, but still huge. 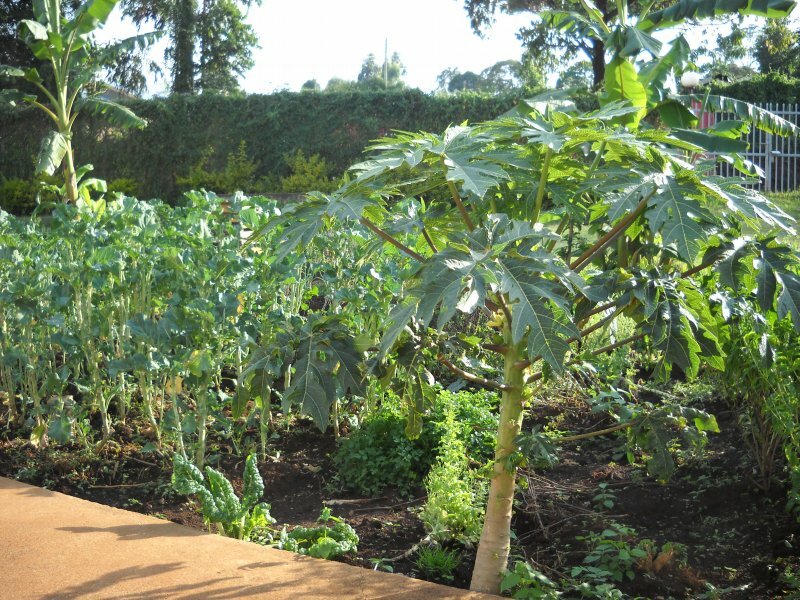 Above you can see most of the shamba, in particular the banana trees that we transplanted as saplings a few months after getting here. We probably won't get any bananas from them before we leave, but it's been fun to watch them grow, and someone else can reap the benefit. 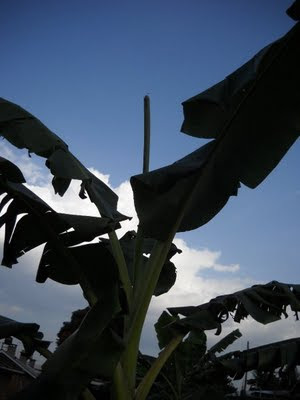 Below, you can see the unique way that new leaves come to banana trees, namely by sprouting this vertical coil of leaf, that then unfolds one day. This is one of the staple foods around here sikumu wiki, which is a kale that is cooked and served with maize meal (ugali). Sikumu wiki means literally "stretching the week", referring to how people eat it when they don't have enough other foods, and they need to get to the end of the week with something. 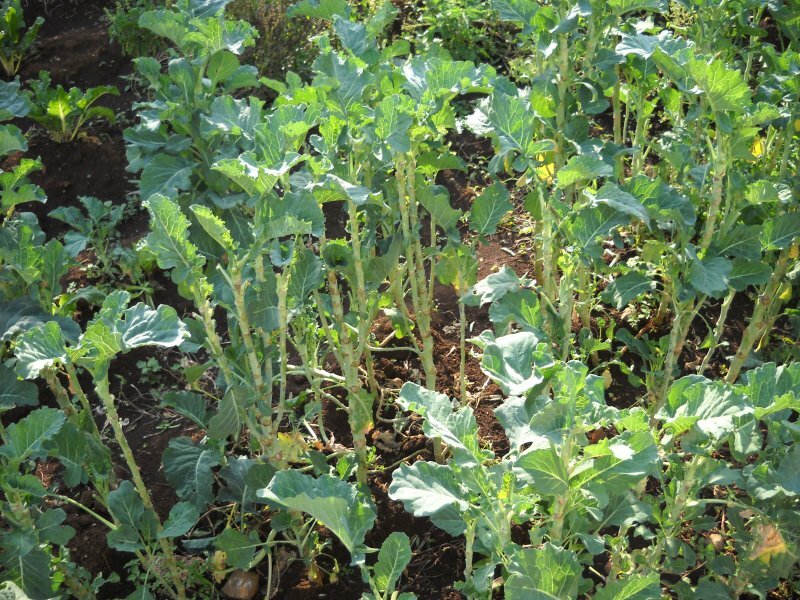 It's harvested by plucking off leaves as you go, so that you're left with these denuded stalks that are still growing. This is our big passion fruit vine. Passion fruit are yummy little round jobs that have little seeds and slurry inside that are definitely on the tart side. I'm convinced someone is pilfering our fruit, since none of us have had much yield from this vine, but at least it's fun to watch grow. 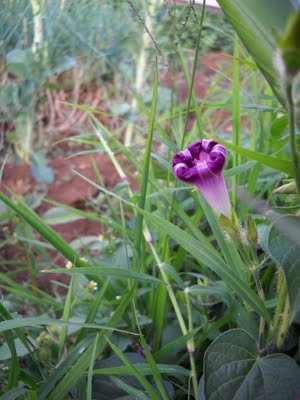 One of the curious things about gardening in the tropics is the perpetual growing season. 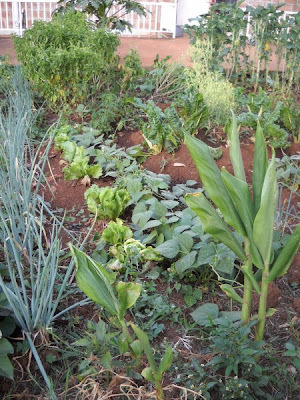 In certain contrast to Michigan, if something doesn't produce (we had some bum pumpkin plants a while back), you just rip them up and plant something else, so there is also a mix of growing stages among the plants in our shamba. In the foreground below, you can see some young ginger plants. We've had some fun harvesting these, and trying to find new recipes for ginger. 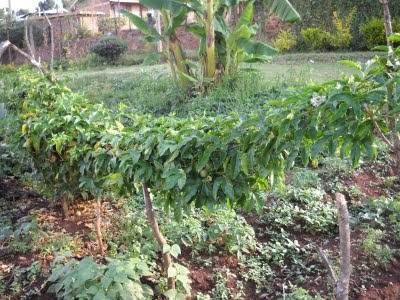 We're not sure how this papaya tree got planted, but there are two now, and they are growing well. 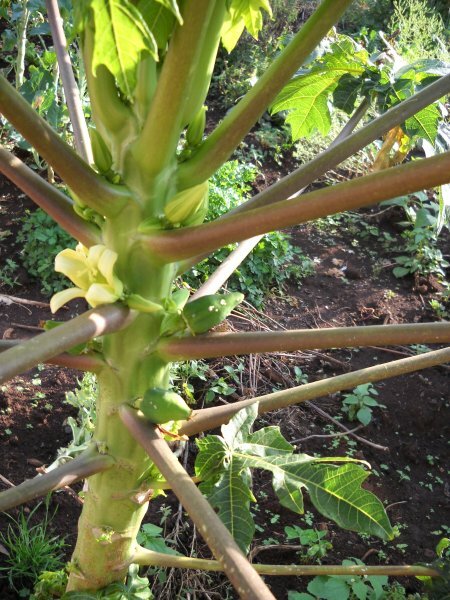 My favorite feature of papaya trees is that they start to produce these huge fruit when they are still really short. 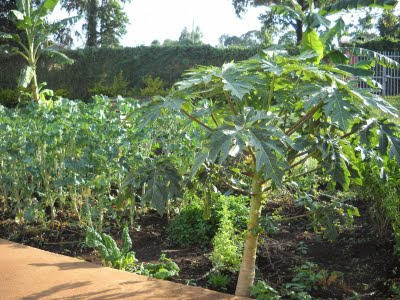 In fact, ours is still below my waist, and yet you can see below some of the fruit growing, which (for those unfamiliar with the papaya) can be as large as an American football. And finally, a couple of the nice flowers that are intermixed with our planted, providing a nice little contrast to the greenery. Alyssa first bought this book, and later Steve Telian brought us a copy of the same. Several of us have waded through its dense chapters in the last few months, and found it pretty foundational and informative. N.T. Wright is an extremely accomplished New Testament scholar who (I think) until recently was also an Anglican bishop. He is a well-respected authority on the ongoing debate on the historical Jesus, but in this book, he takes his biblical and historical expertise to a slightly different topic. 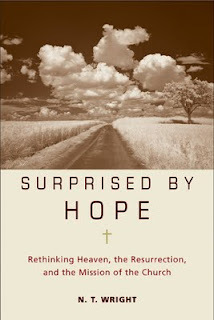 Surprised by Hope: Rethinking Heaven, the Resurrection, and the Mission of the Church is quite a title. The book is pretty heady, but if I can try to distill his main thesis, I would say this: The notion that Christian resurrection resides in a future disembodied existence in Heaven is both false and misleading. Whoa. Instead, he shows (quite well, in my opinion) that both the biblical and historical Christian hope in resurrection is that we will be given new, resurrected bodies to ultimately live in a new, redeemed earth (which has come together with the new heaven). He argues that the reason none of us know this is largely because we've never been told, rather than that we have found this proposition false or wanting. If this piques your curiosity at all, I would refer you first to the end of Revelation as well as the end of 1 Corinthians, where these topics are explained in the most detail. The resurrected body that we await is seen prototypically in Jesus, the first fruit of resurrection. His body is his own, complete his scars from his pre-resurrection suffering, but it has been transformed, made whole and now with new glorified characteristics, such as the ability to walk through locked doors. Paul says, at the end of 1 Corinthians 15, after a long discussion on this type of resurrection, "Therefore... always give yourselves fully to the work of the Lord, because you know that your labor in the Lord is not in vain." Wright points out that the reason resurrection can lead to work being "not in vain" is that our present lives will also be transformed in the way of the resurrection body, i.e. that our work for the Lord's kingdom now will be somehow redeemed and persist into the new heavens and the new earth. Why does all this matter? Why do a bunch of doctors find this foundational? I don't think I'm alone in growing up with a gospel that could be summarized as Jesus' death providing forgiveness of sins, and that forgiveness providing life in Heaven with God after death. I also found the biblical emphasis on doing justice in this present world inescapable, but I couldn't put the two together, since my worldview has this world disappearing, to be replaced with a world in which work has no role. However, if at the Resurrection, after our rest in Heaven, we are given new bodies to live in a new earth with all the pre-fall things for which we were made (space, matter, time, etc...), and if our work for the Kingdom of God now will be transformed by grace to leave some mark in that resurrected world, then my motivations and understanding undergo a paradigmatic shift. In writing about the ramifications on "the Mission of the Church" (the last part of the long title), Wright not only points out how this affects Justice, but also selects Beauty and Evangelism as two other areas that he believes the Church will view differently in light of a true understanding of Resurrection. I leave the book itself to the curious who want to discover what he says, but suffice to say that this book's value lies in the truth it brings to our understanding of the gospel in both Word and Deed. We are all very excited at the arrival yesterday of Janet and Grace Chen and Abby Paternoster, good friends from our home church in Michigan. Janet is staying a week, and Grace and Abby will be with us for 4 weeks, helping out in a variety of ways. We're glad to have them part of our lives for this time, and we love the encouragement they bring from all our friends at Knox. The girls are keeping a blog of their own, so if you've always wanted to view our lives here through the lens of a couple of high school senior girls, then you're in luck. You can check out "Hands and Feet" here. 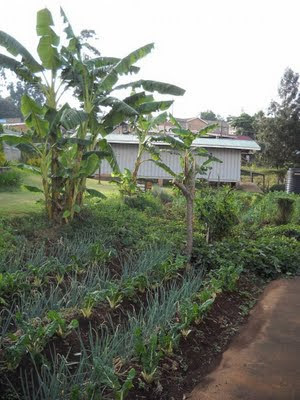 Tenwek Hospital is located in the heart of Kipsigis land--about 85% of our patients come from this particular tribe. Kenya has about 40 tribes living within its borders, relatively peacfully, although as we all know there have been inter-tribal conflicts (as evidenced by the post election violence several years ago). More and more, the younger generations of Kenyans are starting to identify themselves as Kenyan instead of a particular tribe. But one tribe still stands rather separate from the others, keeping to the "old ways." 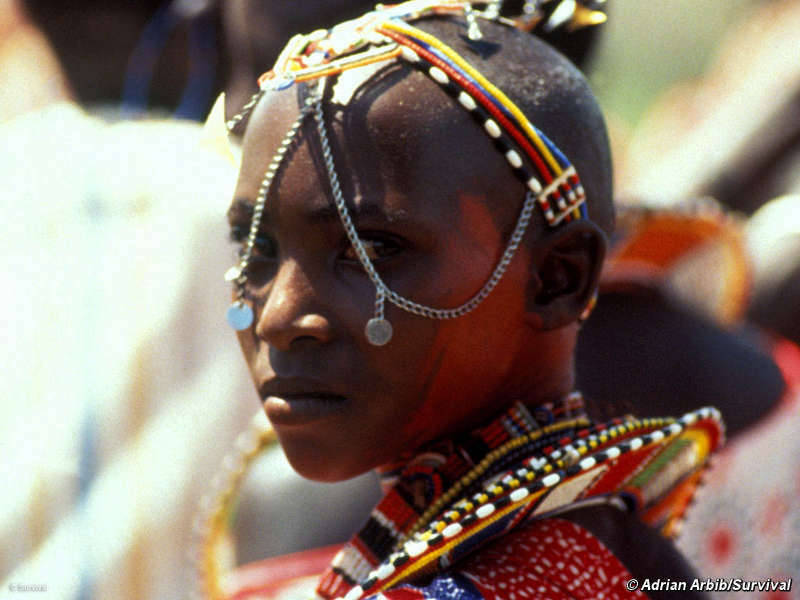 It's the tribe that comes to mind when you think of a "traditional" African--the Maasai tribe. Maasais are a group of people who live in southern Kenya and northern Tanzania, in the midst of some of the best game viewing in the world. They are herders and hunters, with large herds of cows and goats traversing the countryside. And their dress is dramatic, too--red blankets over their shoulders, dangling earlobes, walking sticks, beautiful beadwork. What I have come to find most dramatic about Maasai, though, is their courage and high pain threshold. They are known as a warrior tribe, and they are, as well as stoic. All of us have taken care of a variety of Maasai here at Tenwek (somewhere close to 10% of our patient population) and we've found that you have to figure Maasai-ness into your physical exam. For example, earlier this week I rounded on a young Maasai lady on the OB ward. She had come in with some pain, severe anemia, and a 12 wk pregnancy with vomiting. The diagnosis seemed a likely anemia in pregnancy with hyperemesis (a more severe form of the typical morning sickness of pregnancy). We decided to get an ultrasound to check the viability of the pregnancy and found...a ruptured ectopic (a pregnancy had implanted in her tube and grown too large, breaking the tube open and spilling over a liter of blood into her belly). Yikes! How did we MISS that, you ask? Well, despite having an incredibly painful process going on inside of her, she was sitting up in bed, walking around normally, and barely flinched when I pushed on her belly. After the surgery, a nurse called to ask for some pain medication for her and I joked, "Pain meds? She's Maasai! She doesn't need pain meds!" 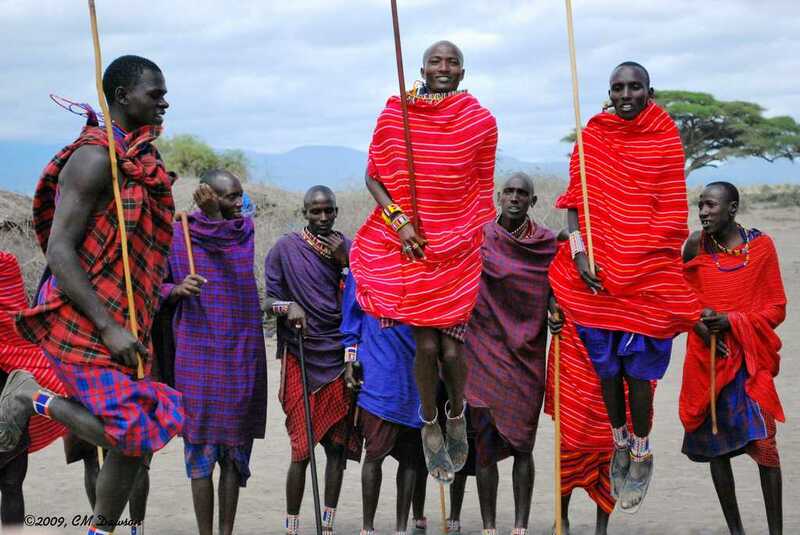 Jason has a great story about a Maasai Moran, which means a warrior, in training. He was out in the bush and got disemboweled--a spear cut open his belly causing his intestines to spill out. EIGHTEEN HOURS LATER he walked into Tenwek holding his intestines in his arms. These people are tough. They also have a distinctive body habitus, tending to be quite thin and fit. I have seen some large Maasai women, but no overweight Maasai women. One morning an intern was presenting a patient during morning report and was asked the question, is the patient wasted? (meaning, do they look thin and gaunt likely due to a chronic illness or HIV) The intern paused,thought for a moment, and replied, "She is somehow Maasai." Ah, said the audience. Everyone undertood what he meant. In summary, it has been fascinating to work and live among different groups of Kenyans. We have learned so much about the differences between them, and have developed a great amount of respect for what our patients go through. Upon our return to the US, though, I think we might have to readjust our expectations of our patients' pain thresholds and appropriate body sizes. . .
One of the visions that God has refined for the McCropders during our time at Tenwek has been the priority of training nationals in the medical field. Jason, Eric, & Rachel have all been extensively involved in the internship and residency (general surgery & family practice) programs at Tenwek, both administratively and clinically. Slowly by slowly (as they say in Kenya) I have tried to follow suit in the eye department. In just the last few months, many of these efforts have started to come together. 1) Dr. Orlando, a Kenyan ophthalmologist who works at a sister eye hospital, has started to come every week to receive training in phacoemulsification (the cataract technique most often used in the States, but very little in Africa because of the expensive equipment). He is coming because a phaco machine was purchased for his hospital, but the company will not set it up because no one is trained how to use it yet. Good news -- the company is now willing to make the machine operational. 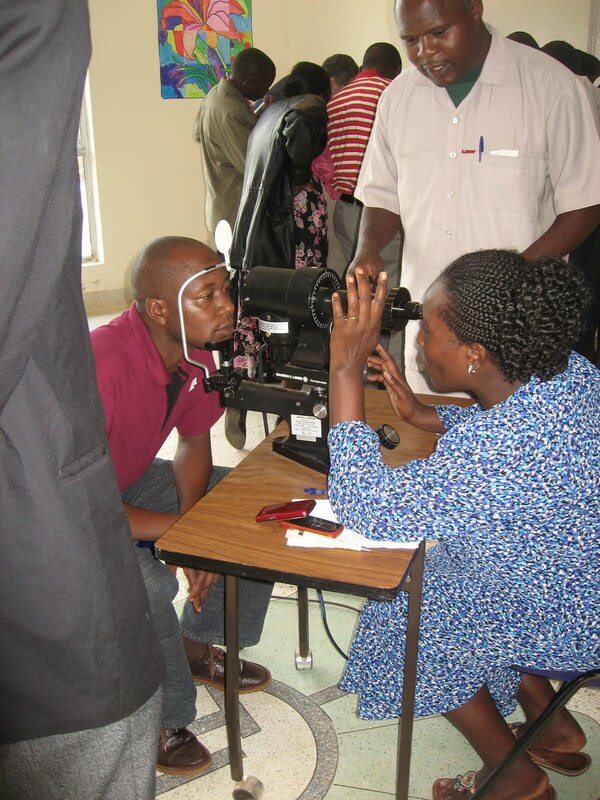 2) In June, we started the 3-month "Ophthalmic Skills Upgrading Course" at Tenwek for nurses and clinical officers who want to increase their knowledge and clinical skills in ophthalmology. David Sawe, our ophthalmic clinical officer, has taken responsibility for the course. Our first class consists of 3 Tenwek employees. We hope to expand the next class to include others outside of Tenwek. 3) This past weekend, Tenwek hosted its first annual professional development course for eye care providers in the region. Our focus this year was on "Improving Surgical Outcomes". We were delighted to host over 25 participants from neighboring eye units. It's exciting to finally be part of the education process! 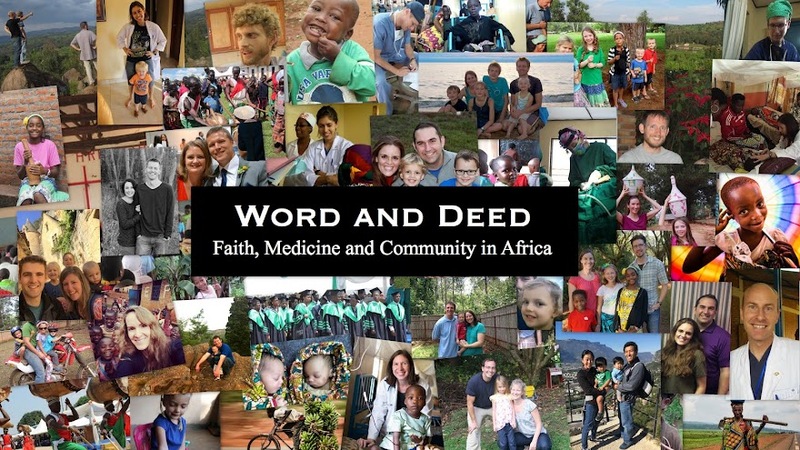 Our goal is to eventually "work ourselves out of a job" by training national medical doctors and other staff so that they can provide quality and compassionate care in the name of Jesus to their own people. We are also blessed to learn many things from our African colleagues. A 31 year old man presents with progressive dysphagia. It's a story we've heard many times. "Dysphagia" is a pretty specific medical term, meaning the sensation of food getting stuck somewhere along it's path down to your stomach. This young man had several months of progressive dysphagia, first with solids, then with liquids, accompanied by weight loss. He had a worrisome barium swallow from an outside hospital, and was referred here. We admitted him to be rehydrated and then to get a scope of his esophagus and stomach, but we already knew the diagnosis: Esophageal cancer. Some of the medical types are currently thinking that I'm rushing it. "Whoa, I mean maybe if he was 65, with a history of chronic reflux, but surely that's not the most likely thing in a 31 year old." I would have thought that as well, but as it turns out, according to the NIH, Tenwek Hospital reports the highest rates of esophageal cancer in young people anywhere. Ever. 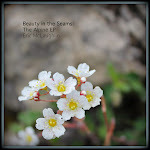 In the world. Right here. This is an incredible tragedy for the people we serve, especially as they almost always present so late that there are no curative options left to them. Our endoscopy department does a phenomenal amount of stenting open esophagi (esophaguses?) blocked by cancer, thus giving people the ability to eat again, and often adding a year or 2 to their lives, but very few people have the option of curative surgery. A few months ago, I sent home a 17 year old young man with unresectable esophageal cancer. That's right. I sent him home from the Pediatric ward to follow-up with our hospice program. Why? Theories abound, and research is being done. Some genetics, some pesticide toxins, some relation to the hot chai that people love drinking. No one is entirely sure, but there is a ton. 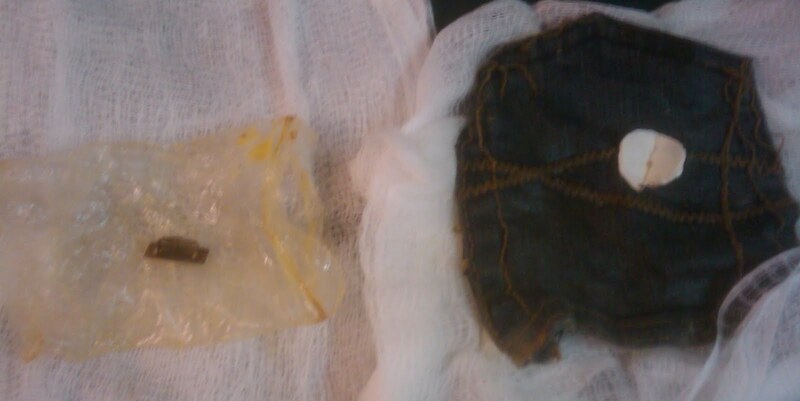 His esophagus was blocked, not by cancer, but by a plastic bag, a metal belt clip, and part of a denim pocket. The offending items were removed to find a totally normal esophagus underneath. How did these strange items get down to a location where they could so mimic a lethal cancer? The answer is unclear, but it sounds like the guy had been deteriorating slowly under a bad habit of illegal drugs (which is actually quite rare around here). We check the above items for evidence of such material, but nothing. So, good news for this guy, though he still has some significant challenges ahead.